Is it a Hindi or English Word? If you sound out each Hindi word, you’ll see how close the English and Hindi words actually are; the Hindi words have generally added the –a sound to the end of the words and the roots are slightly different (e.g. munha for mouth). How did this happen? Couldn’t this just be a coincidence? There so many possible sound combinations for any given word that coincidence is next to impossible. In many cases, where two words are very similar in unrelated languages, one language lent a word to another (e.g. gas is gaz in Turkish). To answer the former question, Hindi and English simply diverged over time, geographic distance and via contact each language had with other cultures. Much like if you were to go many years back into your own genealogy, you’d be surprised to find those that you’re related to live very far from you and may seemingly have little in common with you. In this same vein, a language (here Albanian) that reads like this — Gjuha është një çudi e racës njerëzore – is actually also related to English, as are Russian (Язык чудо человеческой расы) and Iranian (زبان تعجب از نژاد بشر است). Just because a language and the culture it represents are, on the surface, seemingly alien to you, at its deep structure, there may be a close affinity and shared, albeit ancient history. I had the pleasure of taking a class in Old English my junior year at Yale with one of the subject’s great scholars, Fred Robinson. I’ll never forget cramming for that final exam though – he packed essentially the entire language into one semester — it was one of the toughest classes I ever took. The first day of class, I was struck by how different Old English was, both in terms of vocabulary and in grammar. Here’s an example of audio text from the famous Old English heroic poem Beowulf, read by an Old English scholar from the University of Virginia. You can see immediately that the text is essentially unintelligible to any speaker of Modern English. Beowulf represents relatively late Old English. 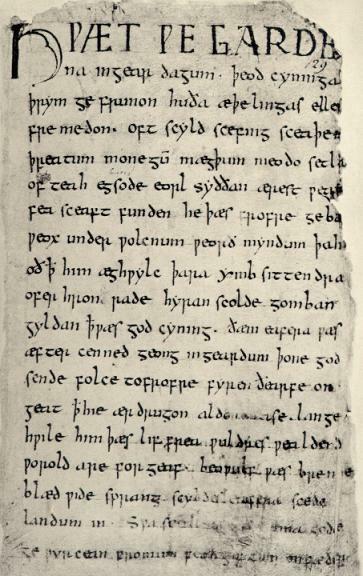 Even though linguists suggest that it has been nearly a thousand years since Beowulf was written and English diverged from German within the Germanic branch of the Indo-European language family, clear likenesses exist between Old English and Modern German. Modern German vocabulary has a good number of words in common with Modern English. Although differently pronounced, you don’t have to look beyond the following German words to see these two languages’ genetic relationship: Finger, Hand, Fisch, Haus, Arm. Reading this aloud, they would have the same meaning in English as you would think they do. However, going back to Old English, these similarities are more pronounced. The Modern English word for cheek is Wange in both German and Old English. A word like elbow in Modern English nicely shows the change that English underwent from its more mainland Germanic roots, where the Old English is elboga or elnboga and Modern German is Ellbogen. Old English and Modern German also have similar grammatical structures. For example, Modern English tends to add –s to the end of a word to form a plural, as in hands and books. In Modern German, Hand becomes Hände and Buch (book) becomes Bücher. In Old English, hand becomes handa and boc (book) becomes bec. In the former cases, a vowel is added to the root, singular word, similar to that of Modern German and in the latter case, Old English simply changes the vowel in the root singular word boc, just as Modern German does — though German also adds –er here. So how did we get from this German-like Old English to what he have today? The answer is exceedingly complex but a good place to start is the Norman Conquest of 1066. Although it didn’t take place overnight, the addition of French lexicon into the English language after the pivotal Battle of Hastings in 1066 marks the beginning of the period of Middle English. Many nobles after the Norman Conquest spoke a language called Anglo-Norman, which was essentially French. The vernacular language continued to be Old English but because of the high social status French, many learned French. Before long, English itself became peppered with thousands of French words. In addition, the grammar began to change. The rule for former plurals gradually began to change to adding –s (how French forms plurals), rather than the more complex plural formation rules found in, say, other Germanic languages like German and Dutch. Even the writing system itself changed. 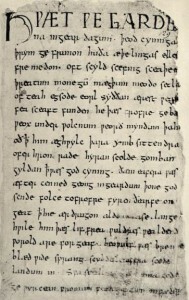 The Old English þ and ð symbols, which stood for th as in “think” and “the” respectively, were replaced by th, to conform to the Norman French system of writing. Slowly, English is starting to become more recognizable to the speaker of Modern English. Then, around the time of Shakespeare, the sounds of the English language underwent an amazing change, called the Great Vowel Shift. It almost sounds like an Encyclopedia Brown mystery – am I dating myself with this one? – but was a real linguistic phenomenon. Without getting too technical with the phonetic here, the main changes were that Modern English, after the Great Vowel Shift, began using vowels produced with the tongue slightly higher in the mouth. You can feel this when you say the Old English word for “name”, written as nama (nah-mah). Here the tongue is way down at the bottom of the mouth. The pronunciation of this sound gradually moved higher in the mouth. You’ll see this when you say “name”. It’s easier to discern when you say just the vowels, /a/ or “ah” in Old English and /eI/ or how we say the letter A, in Modern English. Another great example is Old English “moon”, said mona (as in “Mona Lisa”) and our Modern English “moon”. Again, just say the vowel in those words one after the other and you can really feel this shift higher. At this time, perhaps the greatest literary mind ever, William Shakespeare, was active and coining nearly two thousand words we commonly use to this day. Examples of these words are: laughable, eyeball, gossip, moonbeam, bloodstained, tranquil. Shakespeare drew from so many different etymological sources. “Tranquil” has a clear Latin root whereas “eyeball” is a compound derived from English’s Germanic roots. Here is a great site that catalogs many of these Shakespearean contributions to Modern English and links to the actual text from the play, act and scene the coined word comes from. English is further becoming the language we use today. Now, no one would actually speak like this, so why would anyone make a supposed rule of correct grammar that most people break? The answer is that, in effect, there are no rules of language, just patterns that are called grammatical when the great majority of speakers follow them. I bring this up to say, in the context of a discussion on the history of the English language, stay tuned! Our beautiful, dynamic language will indeed change and I, for one, will thoroughly enjoy watching this drama (and comedy) unfold.